It’s become all too easy, and oftentimes preachy, to filter many a new or prominent returning TV series through the prism of Donald Trump’s divisive presidency. 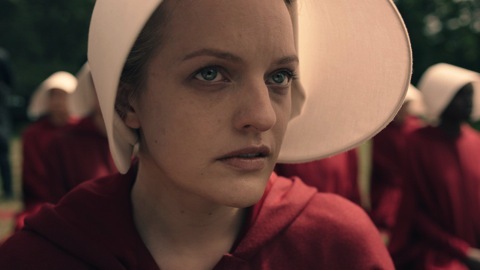 There’s little choice, though, with The Handmaid’s Tale, which already has been embraced by “The Resistance” as a chillingly cautionary look at what could happen to women if the still nascent Republican administration is allowed to have its way. In short, they’d be subjugated, tortured, forced to be surrogate wives and required to dress in lookalike cover-ups suitable for a convent. Black-clad male goons with automatic weapons keep everyone in line. Margaret Atwood first wrote the same-named novel in 1985, and it was adapted into a messy 1990 feature film with an imposing cast that included Natasha Richardson, Faye Dunaway, Robert Duvall and Elizabeth McGovern. Hulu’s 10-episode Season One of Handmaid’s Tale, with the first three hours streaming on Wednesday, April 26th, looks to be clearly superior so far. Still, if a male TV critic dare say this, it can be heavy-handed at times while also being overly tethered to somber narration from the renamed Offred (series star Elisabeth Moss), who used to be June. Captured and separated from Hannah after her husband is murdered, June is soon seen as Offred, which literally means Of-Fred. That would be a commander named Fred Waterford (Joseph Fiennes), whose joyless wife, Serena Joy (Yvonne Strahovski), is among the many women who can’t conceive due to infertility caused by environmental contamination. It’s Offred’s principal job to bear the couple’s child as a part of a decidedly rigid, rote “ceremony” in which a clothed Fred enters her while Serena straddles the top of Offred’s head. Informants are rampant, though. And insolence is decidedly not tolerated. So a newcomer named Janine (Madeline Brewer) wasn’t very smart to sass an uncompromisingly vicious Handmaids instructor known as Aunt Lydia (Ann Dowd, fresh from another domineering role in HBO’s The Leftovers). No, that wasn’t very smart at all. Aunt Lydia, who brandishes a high voltage shocking stick, also is repulsed by any “gender traitors” in their midst. “That satan was an offense to God. She was a disgusting beast!” Aunt Lydia bellows in Episode Three. Therefore, use of the word “gay” is strictly forbidden and subject to corporal punishment. June’s best friend in the free world was Moira (Samira Wiley of Netflix’s Orange Is the New Black), who’s now also a handmaid. She’s mostly seen in flashbacks, though, due to a somewhat puzzling and abrupt development down the stretch of Episode One. Another handmaid, Ofglen (Alexis Bledel), is Offred’s designated companion during trips to the market. This ends up being very problematic for both of them. Not all of the men in Handmaid’s Tale are abject beasts -- at least not outwardly so. Commander Fred appears to have a gentle, refined side to him while his young driver, Nick (Max Minghella), just might be sympathetic to Offred’s plight. Moss’ character is at the center of it all, whether in flashbacks or at the mercy of her captors. Her performance is both touching and fierce, with basic sanity at stake in a world where one false move can close the door on everything. Episode One ends with Offred underscoring her defiance while Lesley Gore’s 1963 anthem, “You Don’t Own Me,” accompanies both the final scene and the closing credits. Handmaid’s Tale comes off as that sort of rallying cry in perceived times of need for many. Atwood never envisioned a Donald Trump presidency back in 1985, when the congenially conservative Ronald Reagan held the office. Now her novel resonates, even if its latest adaptation sometimes could stand to take a chill pill or two.